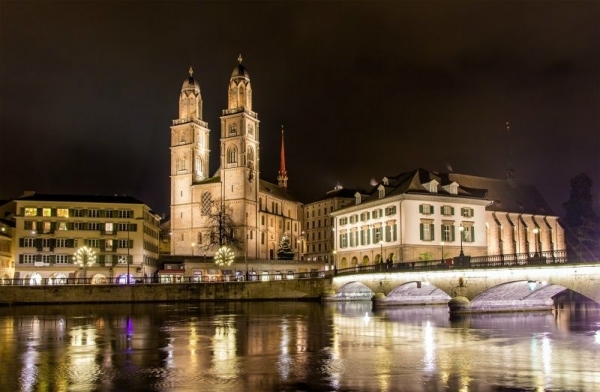 Zurich has only 400,000 inhabitants, but it is the largest city in Switzerland. The size doesn’t matter in this case as Zurich is a global financial center and banking hub. 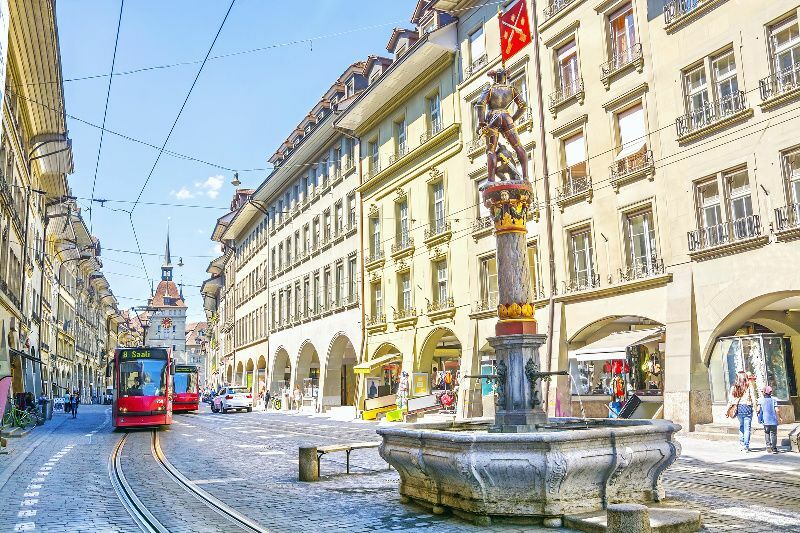 Many mistake it for capital of Switzerland (the capital is Bern), and for a good reason: it’s a quintessential Swiss city and at the same time very international. It is also a city with very natural mixture between ancient history and very modern life on every step. 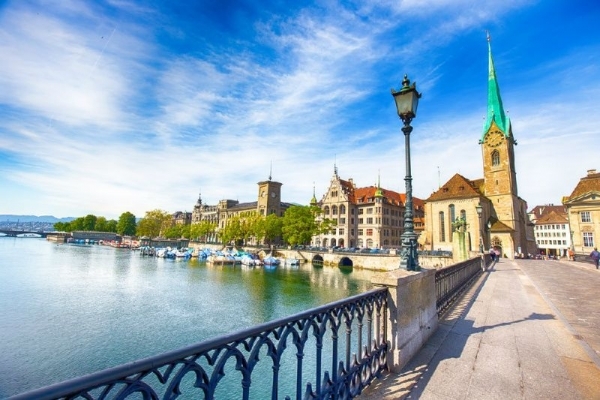 It is sitting on the shores of Lake Zurich and banks of river Limmat, the setting that reminds very much of Geneva. Unlike Geneva, which is reflecting French culture, Zurich is predominantly influenced by its Swiss German heritage. Lake Zurich. 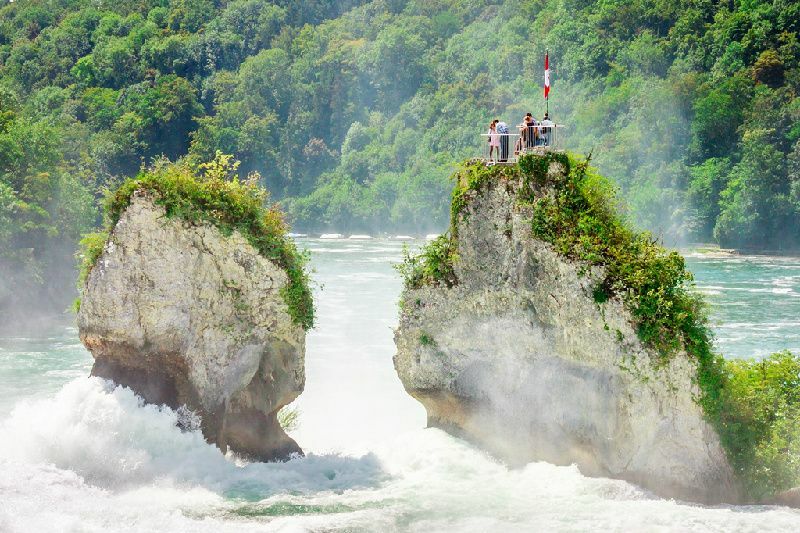 Located in the south side of Zurich and stretched over 40 km in a banana shape, this lake is popular for boating and swimming. Very popular during summer with hikes and mountain views. Grossmünster. Landmark 12th-century cathedral in Zurich, one of the four churches in the city. Legend mentions its name all the way in 8th century. Fraumünster Church. An 11th century church, built on remains of the abbey from 10th century. Featuring stained glass decoration by Marc Chagall. Bahnhofstrasse. Main pedestrian street in Zurich lined with high-end shops and designer boutiques. Swiss National Museum. Founded in 19th century, this museum exhibits about Swiss history, crafts and furnishings. Featuring many interactive exhibits. Uetliberg. Mountain above Zurich, famous for hiking and beautiful view of the city and Zurich Lake. Kunsthaus. Established in 18th century, this gallery host major European artworks from 15th century to the present. Zoo Zürich. Considered as one of the best zoos in Europe, this zoo, established in 1929, is the home to over 300 species. Lindenhof hill. Original city center on the hilltop, featuring views and outdoor chess boards. St. Peter Church. Historic church, fourth by the size in Zurich, featuring large tower clock. Zürich Opera House. 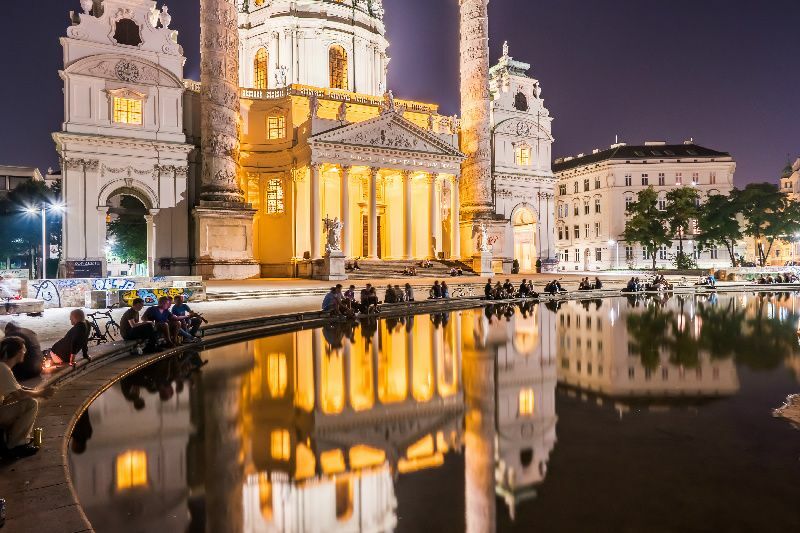 Opened in 19th century, this neo-baroque venue hosts opera, theater and ballet plays. FIFA World Football Museum. Football related exhibits hosted in a newly opened museum. Also available: sports bar, eateries and a library. Felsenegg. Vantage point above Zurich, with views overlooking valley and a restaurant. Paradeplatz. A famous square at the Bahnhofstrasse in downtown Zürich. It’s one of the most expensive pieces of real estate in Switzerland. Chinese Garden. Located lakeside, this garden oasis features a pond, bridges and pavilions. Polybahn. Victorian-era funicular railway connecting Central Square in Zurich with ETH polytechnic university. Bürkliplatz. A town square, named after Arnold Bürkli, famous Zurich engineer, and it is one of the central points of the road and public transportation. Le Corbusier House. The last building designed by famous architect, a steel and glass multi-color design, open to the public. 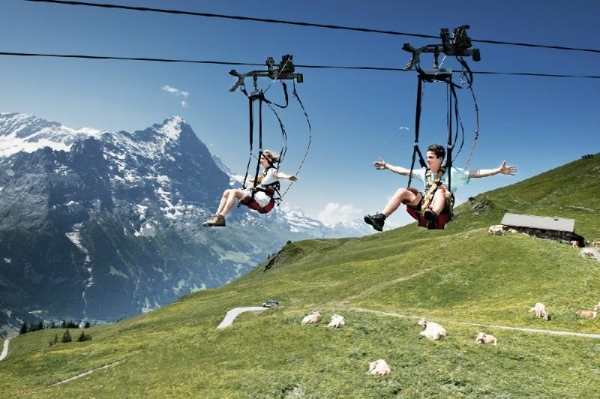 From other attractions we recommend: Botanical Garden of the University of Zurich, Zürich Wilderness Park, Cabaret Voltaire and Museum für Gestaltung Zürich. 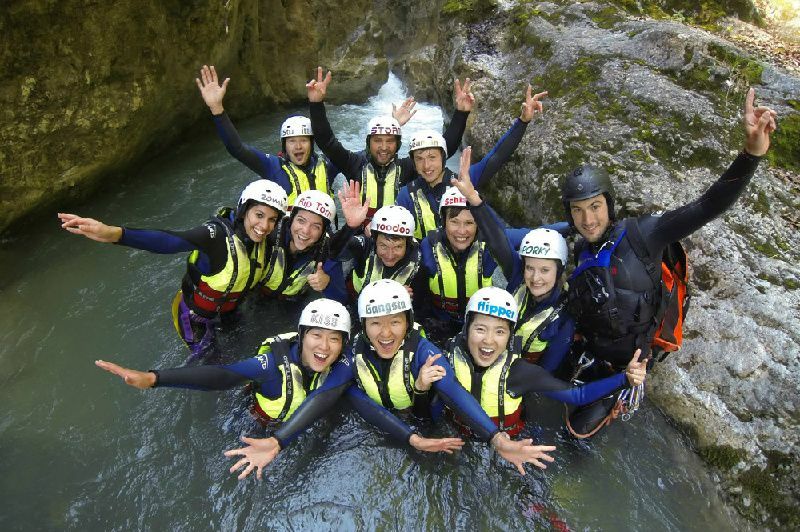 There are numerous attractions that we didn’t mentioned in our list as this is a quick spotlight, but if you have time for some additional activities, we can recommend following: River and lake cruise, there are some sightseeing and some nice dinner cruises available, day trips to various cities within Switzerland, several option to go for a hike in Alps, or just enjoy mountain views, and, of course, go for a shopping for famous Swiss chocolate, cheese and watches. Antigel Festival (February), International Geneva Motor Show (March), Geneva Marathon (May), Museum Night (May), Lake Sailing Regatta (June), Montreux Jazz Festival (June-July), Geneva Lake Parade (July), Geneva Festival (August), Christmas Festival (various events from November through January). You can visit Geneva’s Mayor’s Office straight form the street, as a tourist. You can get Geneva Transport Card for free, in order to move around the city. About ten percent of Geneva residents are employed by international organizations. 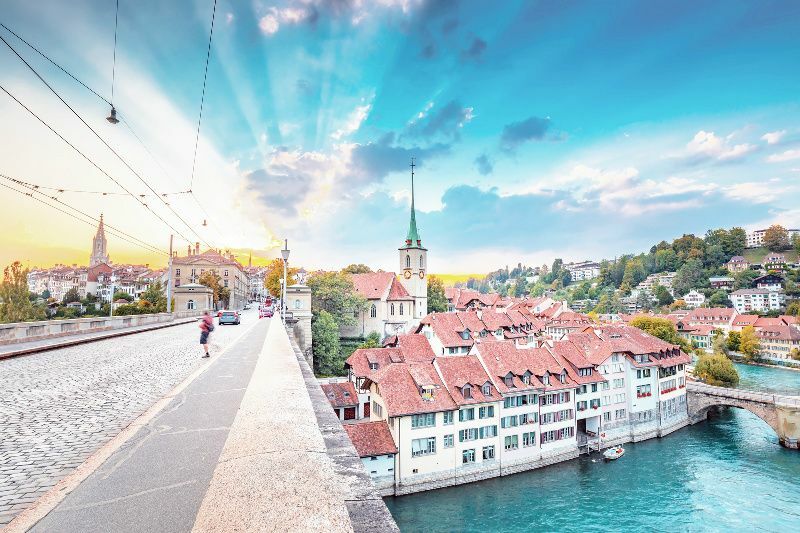 The peak season for flights to Zurich is July, August and December. The low season for purchasing tickets is February, June and November. Zurich is served by Zurich Airport (ZRH). 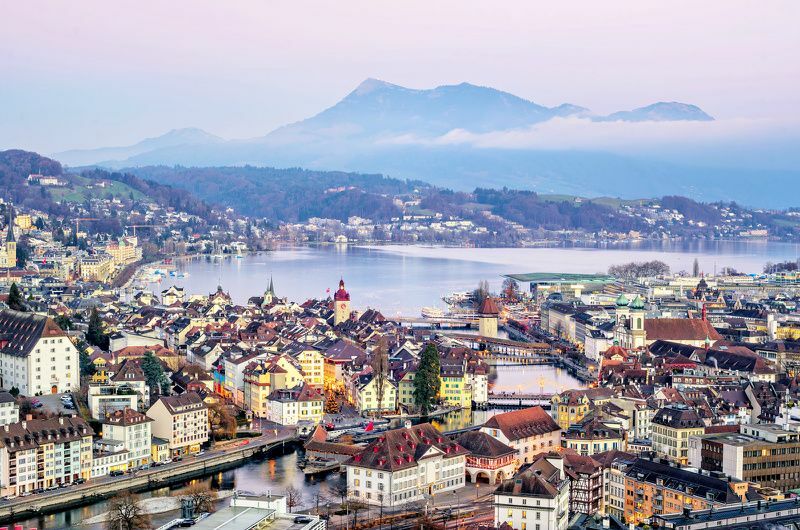 Direct flights to Zurich are offered by 46 airlines.